I did a series of 3 different detoxifying yoga routines about 10 days ago (1 routine per day) and last week I came down with a heavy cold but I figured the cold was due to lack of sleep and climate change rather than those routines… Maybe it was a combination of all of the above? But my question is, once you have a cold or flu, what poses do you recommend to alleviate the symptoms and boost the immune system? This is a great question Lea. As I have mentioned in a previous blog post. When you are sick, I recommend that you stay in bed and rest. When you start to feel a little better I recommend practicing restorative yoga. 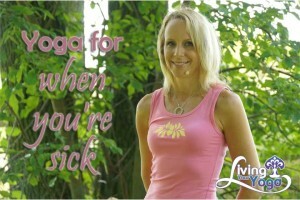 As they say, an ounce of prevention is worth a pound of cure and so I would recommend our Yoga Immunity Boost video in cold and flu season to prevent colds and flus, but not once you get a cold or flu.